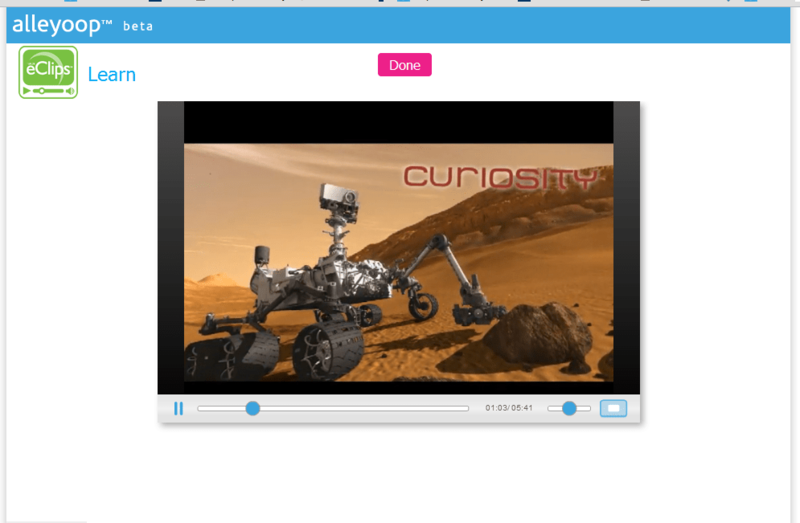 NASA is one of several partners providing educational content to Alleyoop users. Image source: Alleyoop.com. In February, the innovative educational website Alleyoop launched with personalized, interactive math instruction for students ages 13-17. Now Alleyoop has added a full range of science tutorials to its lineup, featuring content from partners such as NASA, National Geographic, and the National Science Foundation. Alleyoop is geared toward middle- and high-school students who are looking for extra help in math and science, with an eye toward college readiness. It makes use of gaming mechanics and a clever interface to encourage progress and keep kids engaged. I got a peek at the new science offerings, and I have to say I very much liked what I saw. Subject areas encompass earth science, life science, physical science, biology, chemistry, and physics; Alleyoop’s mission is to provide tutorials in every topic covered in a typical science curriculum according to the Next Generation Science Standards. Their math instruction encompasses the new Common Core Standards. For an outside-the-box homeschooling type like me, Alleyoop’s appeal lies in its game-based approach — I’m always looking for resources that make learning fun and engaging — and its thoughtfully curated content. Instead of combing through YouTube for a good video on, say, the atmosphere (and, if you’re me, probably getting sidetracked by cat antics and “how to eat a watermelon” tutorials), you can log into Alleyoop and immediately find an informative, high-quality video or activity from one of its partners — and that lineup of partners is pretty exciting. NASA! The National Science Foundation! Other content providers include Adaptive Curriculum, Brightstorm, Scientific Minds, and Virtual Nerd. There is no fee to use Alleyoop — students complete missions to earn a currency called “yoops,” which they may spend on various kinds of tutorials (including a one-on-one tutoring option) — but additional yoops may be purchased with real money, similar to the “buy more gems” option in games like Dragonvale . You don’t ever have to spend a dime, but if you’d rather invest money than time, the option is there. My kids and I will be taking a closer look at Alleyoop in the months to come, but for now I’m pleased to see another innovative learning environment working to make STEM accessible and fun for teens. ← Introducing GeekMom’s Pony … Curiosity Cientifica!